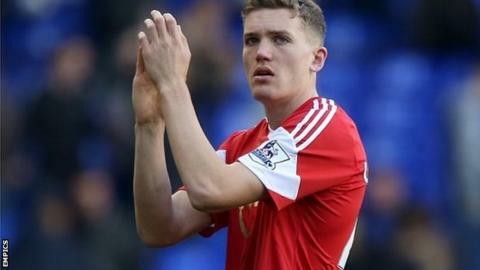 Southampton striker Sam Gallagher has praised the club for the way in which they have helped him come to terms with the sudden death of his father. Gallagher, 18, lost his father Richard in February after a short illness, days after making his full Premier League debut against Arsenal. The England Under-19 international says he is glad he had football to help him channel his emotions the right way. "It's been handled very well," Gallagher told BBC Radio Solent. "Everyone was really comforting but not too much like you feel you are being treated differently to before. "Everyone gave me the space and allowed for what might happen. I have great support around me from family and the club." Gallagher says the death of his father has helped him reassess what is important in life. "It does make you think about what really matters," he said. "I think it has made the whole family stronger. I see my mum and sisters a lot more at games. "It makes you realise you don't have that much time. "I gave myself a week to be there for my mum and my sister. Then after that I thought the best way to deal with it was to get back up and do what I've been doing." He has made 17 first-team appearances this season, scoring twice and thinks the past six months at the club have been like a "dream". "I could only really dream of being in the position I am in at the moment," he said. "It's just been so rapid." Gallagher has been helped in his development by fellow forward Rickie Lambert and despite his rapid rise to prominence believes he has remained grounded. "I still keep in touch with all my old mates from school," he said. "I go home every now and then which is nice. It keeps my feet on the ground." The full interview with Sam Gallagher can be heard in the build-up to BBC Radio Solent's commentary of Saints' game against Everton on Saturday at St Mary's. Kick off: 12:45 BST.